So easy you could publish one. 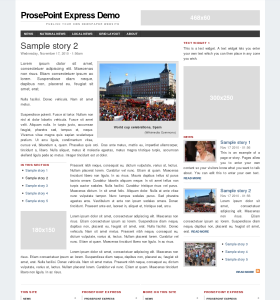 ProsePoint Express is a newspaper and magazine CMS (content management system) for publishing news-based websites. This next generation software creates great looking websites and is so easy to use, even you could publish one. If you've ever wanted to publish your own online newspaper or magazine website but didn't know how, then ProsePoint Express is for you. You can have your own news website up and running in a matter of minutes! ProsePoint Express features a lightweight web-based newspaper cms which makes it a breeze to manage and edit your stories. It is really really easy to use. Posting a new story? Just click, enter your text, and save. It's that simple! ProsePoint Express and its multi-channel, multi-column technology makes sure your new story appears in all the right places, automatically: Saving you time and hassle. Don't fiddle around with editions and layouts just for a single story. Want that newspaper look and feel? No problem. ProsePoint Express features a unique layout manager that implements a 48 column version of the 960 Grid System which is also adjustable. You can choose your own 1, 2, 3 and even 4 column layouts! The column widths are even resizable so you can change proportions to suit. Why restrict yourself to inflexible sidebars? ProsePoint Express isn't just easy to use. It looks great too! Why spend thousands of dollars getting a website custom developed and built when ProsePoint Express can give you a better looking website for a fraction of the cost? The inbuilt newspaper cms and its robust data entry system ensures your site always looks great no matter what you throw at it. A slick and professional ProsePoint Express website will help you retain repeat readers and, more importantly, grow traffic. Do you plan to show ads on your newspaper website? If yes, then ProsePoint Express is for you! In addition to a native ad server plugin, ProsePoint Express also works with third party ad networks such as Google Adsense, Amazon and others. Use the ad provider that makes sense for you. Did we mention that ProsePoint Express is really easy to set up too? You don't have to download or install anything. You just have to sign up and our site creation wizard will prepopulate and configure your new site for you so you can start posting straight away. Just add content and you're ready to go! ProsePoint Express operates off a rock solid reliable cloud-based service that easily handles all your readers. Your site will remain fast even with many visitors. There's no need to do maintenance or troublesome upgrades either. All that is automatically taken care of so you can have a hassle free experience. With ProsePoint Express Newspaper CMS, we've taken the things we've learnt and created a service that is: easy to use, easy to setup, stays looking great, high performance, and zero maintenance. It's everything that you'll need! A newspaper or magazine website with ProsePoint Express will make your life much easier. Publishing an online newspaper or magazine is so easy even you could do it. Please sign up for a free trial to create your site today! It's free! Saanj News is a newspaper website for Saanj, a social network convering a variety of Canadian and Indian topics. They were looking to create a newspaper website for their members and also expand the reach of their audience. In the search for a solution, Saanj tried many alternatives but they each had certain limitations and the end result didn't look good enough for a news website. Then they came across ProsePoint Express which did produce great looking results. After reading the documentation, Saanj decided it was the best system for their newspaper website. Huntington News were using old style html editing to update and maintain their local news website. This posed problems as staff had to submit changes to a webmaster and wait for the results, creating a bottleneck that was impacting their ability to deliver timely and accurate news updates. In trying to remove this stiffling bottleneck, Huntington News realised they needed to switch to a content management system (CMS) where staff could post their own stories and make their own changes. Yet at the same time, they didn't want to shock their readership with too much change at once. It was highly desirable to keep the appearance of the website unchanged as much as possible, despite it being a design from several years ago. In other words, Huntington News wanted the transition from html editing to a modern web-enabled CMS to be as painless, seamless and transparent to the readers as possible. After the transition, then they would consider a site redesign. Huntington News found ProsePoint Express and after a couple of weeks of evaluation and email discussions, they signed up and prepaid for six months. They were convinced that ProsePoint Express was the way forward.